This very special small acreage property has been the much loved home of my vendors for the past sixty years. Over this time four generations have enjoyed all the benefits of waterfront living plus the unique privilege of having 5,581m2 of space within town to keep a menagerie of pets and live it up with a wide variety of home grown fruit and vegetables. 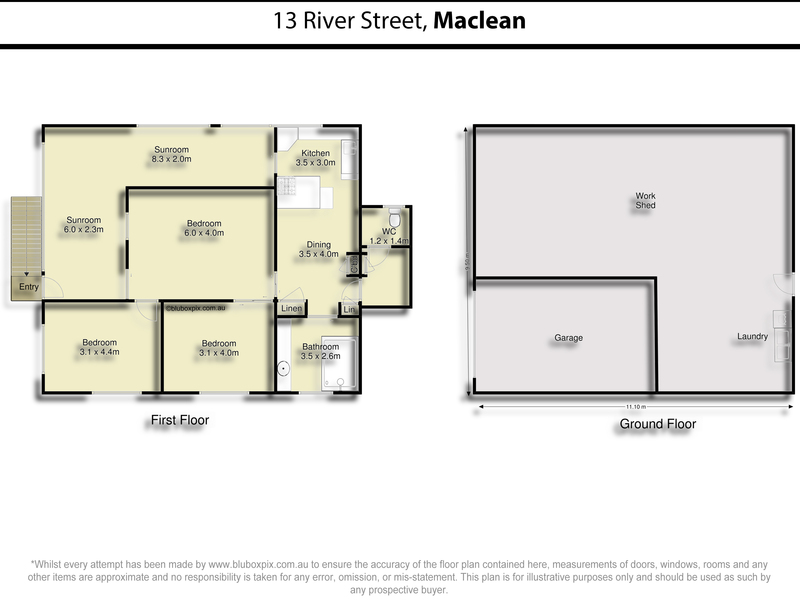 13 River Street, Maclean offers a very neat, older style, elevated home that boasts loads of great features and sweeping Clarence river view. The upper level has two generous sized bedrooms plus a large sleepout / sunroom that wraps around two sides of the home providing ample space for additional bedrooms if required. The lounge area is central, spacious and offers year-round comfort with reverse cycle air-conditioning. The kitchen is a decent size with a corner pantry, it has plenty of bench plus cupboard space and great natural light through two well positioned windows. The main bathroom has a large shower, vanity, separate toilet and linen storage is easily accessible upon entry. The downstairs area has a concrete floor, height restricted secure parking for one vehicle, laundry facility, loads of storage and workshop space. Whether you are an opportunist considering possible development potential, a market gardener or you just fancy the privilege of space to keep a horses or livestock this exciting property is certainly one that must be viewed. To arrange an inspection contact the listing agent Ken Bolton on 0402 405000.